Not a #leapyear… so what?! Ask him to #marry you anyway!!! Look ladies… the next leap year is in 2020… Do you want to wait until then? It really is simple… here is advice from a dating coach… Ladies just get down on one knee and do it… but make sure you look your best of course and bring out your natural beauty. Getting married in the summer months is a popular choice for people in the UK… there is more likelihood that the sun will shine, and that people will be able to take time off for the wedding, as well as amazing options for outdoor ceremonies, including the beach in Whitstable, which is a stone throw from my salon, Pinkies. What makes a great #bridal Make-up artist? I am so lucky to be able to bring different elements of my work together; from beauty therapist to celebrities and VIPs, to nails and treatments in my salon, to make-up for models and actors on set, and of course all of the lovely brides and bridesmaids I bring out beauty of… But what makes a great bridal make-up artist? You have to be prepared for all eventualities… for example a trial may have gone one way, but on the day, the bride may have a break-out, or patches of dry skin, or she may have even changed her lip choice, or bridesmaid choice – a host of things can happen – so be prepared with the right equipment, products, your notes from the trial and more. Arrive on time, this is a day that you cannot afford to be late, not only does it look bad on you as a businessperson, but more importantly, if the bride is late and it is your fault then that is not a good thing… so be early, and give yourself plenty of time to apply the perfect make-up for the bride and her bridal party. If you are prepared and early then it is likely that you will give off calm vines too – it is so important that the bride doesn’t feel stressed, so if you act frantic around her then this could make her feel nervous and not in safe hands. Stay calm and collected. Remember that your bride will have so many things to prepare for during the lead up to her big day, she is not going to want to be chasing her make-up artist to check you are still going to turn up… so do your admin… send regular messages to reassure the bride that you will be there and that you have you need, do last minute checks for changes too… this admin must be relevant – don’t stalk your bride, she has enough to do remember, but keep all communication clear, concise and open – this includes the invoice and paying process. 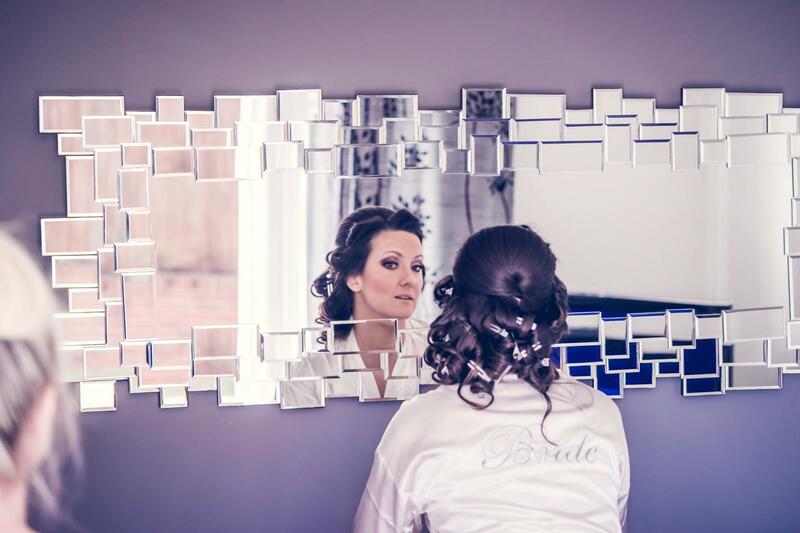 Enjoy it – just like any job, if you enjoy working with brides, despite the prep and early starts then this will shine through, and brides want to work with people that are positive, friendly and professional. They also want to be listened to – so ensure you listen to their needs and desires for their big day from the very first point of contact. You will need the skin to look fresh and flawless to achieve a summer bride look. I applied Airbase Primer to the skin as the perfect base for the Airbase Airbrushing Foundation to sit beautifully on and give a flawless look. To withstand the heat in the summer you need a good foundation to prevent the foundation from disappearing and sliding off. if you have any oiliness all you need to do is pat the skin with a tissue and this revitalises the foundation. Firstly, I applied a primer to the whole eyelid to avoid creating creases in the eyeshadow. Yes it is supper important to go for waterproof mascara, as there is likely to be tears of happiness from the bride at the wedding. I used a rosy pink tone to enhance the cheekbone and to add colour for a fresh summer look. Before I applied the lipstick I always make sure the lips are hydrated and are free of any dry chapped lips, to do this I apply a lip balm – I used a glossy cerise pink tone to add freshness to a kissable pout – which finished the summer bridal look perfectly.